The life expectancy for older adults has been continuing to increase, and those 65 or older are now the fastest growing portion of the population. As this age group keeps growing, it's important to help preserve their ability to live independently and function well. Mobility, the ability to walk without assistance, is a major component of functioning independently, and those with low mobility often experience a lower quality of life. Physical activity is believed to prevent or delay the onset of disability issues with mobility, but no studies have tested this over a long period. 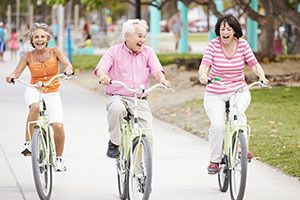 Therefore, a powerful study called a randomized-controlled trial (RCT) was conducted to evaluate the long-term effects of a physical activity program on the mobility of older adults. Researchers recruited individuals between 70-89 years old who didn't get much regular physical activity and were at a high risk for mobility disability. Of the 14,831 individuals screened, 1,635 were accepted and randomly assigned to either the physical activity or the health education group. The physical activity program involved strength, flexibility and balance training, and regular walking with a goal of 150 minutes per week. The health education program consisted of weekly (for the first 26 weeks) and monthly (thereafter) workshops. They featured topics important to older adults and some stretching exercises, but no physical activity topics. All patients were assessed every six months for at least two years with questionnaires, but the main outcome was the ability to walk 400 meters within 15 minutes without sitting or any assistance. Overall, the amount of time patients were followed-up for was 2.6 years. During that time, patients in the physical activity group experienced significant reductions in their mobility disability compared to the health education group. These patients adhered to the program very well and also maintained an average of 218 weekly minutes of walking and activities in the follow-up period. The results of this study, which is considered the largest and longest duration RCT on this topic, suggest that using such a program on at-risk older adults can lead to significant benefits that may increase their abilities and preserve their independence. By filling out the form, you are providing express consent to receive communications from Therapy Specialists of Oklahoma. You may opt out at any time. Copyright (2017) Therapy Specialists of Oklahoma. All rights reserved.